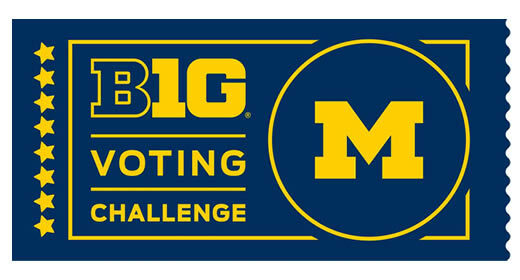 As you may be aware, the University of Michigan is currently participating in the Big Ten Voter Challenge, a competition to boost student voting turnout on Big Ten campuses in upcoming elections. Part of our broader commitment to civic engagement is participating in our democracy, and through this initiative we hope to increase student participation in elections. Turn Up Turnout, a student group on campus, has challenged schools, departments, and student organizations to take the “90% Pledge,” a commitment to getting 90% of eligible students signed up on TurboVote and registered to vote in federal, state, and local elections. We are hoping that everyone who registers will also get informed, and get out and vote. Here’s how you can join us. Upcoming Ford School events will include opportunities to sign up on TurboVote for registration materials, absentee ballot materials, and election reminders. You can also get signed up right away by clicking the link above. Even if you are already registered to vote in Michigan or your home state, TurboVote is a helpful way to stay informed about upcoming deadlines, sending reminder emails for critical elections. We are tracking how many Ford School students sign up for TurboVote, and our goal is 90%! If you’ve already signed up for TurboVote through another school or group, please use this link to have your signup count for the Ford School’s pledge goal as well. Get informed and educate others: What does it mean to be civically informed and engaged? How do we educate in ways that align with democratic values and principles? How do we measure civic and political participation? Formal and informal teaching and learning opportunities play an important role in answering these questions. This is a nonpartisan effort to ensure that all members of the U-M student community are informed about the voting process, including deadlines and procedures, and their right to participate in elections. We are also committed to sharing nonpartisan information on issues and candidates. Stay tuned for upcoming Ford School events that will consider some of the policy issues at stake in upcoming elections and ballots. The Ford School events calendar is available here. Data for this cross-campus effort is being captured through The National Study of Learning,Voting, and Engagement (NSLVE). In the 2012 and 2016 Presidential elections, more than 23,000 U-M students registered to vote (~64% of eligible students). 69% of those who registered voted. We can do better! Become more involved: If you or your student group would like to get involved in the school’s efforts or the Voting Challenge effort more broadly, you can contact Ford School student Zoha Qureshi (qureshiz@umich.edu) or Logan Woods (ltwoods@umich.edu), Secretary of Turn Up Turnout. TUT is a student-driven organization with members from across the university who are committed to increasing voter registration and participation among young people. They meet several times throughout the semester to carry out this work. We hope you will join us in these efforts.